As the fried-chicken restaurant’s Latin American region ventures into delivery, COO Agustin Dominguez-Larrea explains why it’s important to honor the brand’s future and its past. Many people have played the Colonel. Norm Macdonald, Jim Gaffigan, Rob Lowe, Ray Liotta, and—as of January 2018—even Reba McEntire. Age, profession, and gender aside, all of these entertainers have donned the crisp white suit, string tie, and snowy hair and goatee of the late KFC founder, Harland David Sanders. It’s a marketing campaign that blends the past with the present. Although the imagery dates all the way back to 1950—when Colonel Sanders first donned his iconic wardrobe—the metafictional humor and constant switching of performers is very much in line with today’s comedic sensibilities. When it comes to his role as chief operating officer at KFC, Agustin Dominguez-Larrea takes a similar approach to the company’s expansion. “We need to stay nimble and understand what our consumers want,” he says from KFC’s Latin American and Caribbean business offices in Fort Lauderdale, Florida. He’s specifically talking about a massive foray into home delivery. 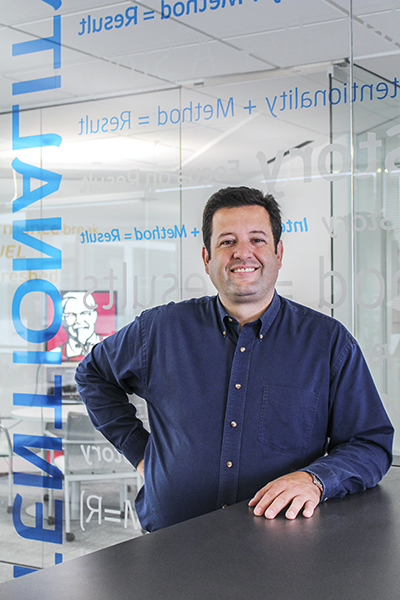 As COO, Dominguez-Larrea is in charge of operations for all of KFC’s countries south of the United States border, which means his work spans from Mexico all the way down to Argentina and the Caribbean islands. Of the forty-two countries that currently make up the brand’s Latin America business, sixteen of them currently have delivery at their stores. The goal is for every possible store to offer the service, including any brand-new establishments. According to Dominguez-Larrea, the increased need for delivery—both within his region and the United States—comes from the fact that, in 2016, consumers began spending more at restaurants than grocery stores. He’s right. As Time reported in June 2016, Americans now purchase a majority of their meals from restaurants. So how does Larrea ensure that KFC—a chain whose success has leaned so heavily on a history of brick and mortar dine-in and carry-out restaurants—seamlessly make such a shift? The most crucial element comes from the brand’s franchise owners. Whenever a store is ready to take the leap and start offering delivery, KFC has a dedicated delivery team at the Latin American/Caribbean office that pairs the franchisee with all of the necessary technology, including the appropriate aggregator (such as Grubhub),e-commerce platform and delivery management platform. “It’s the franchise team on the ground in each country that’s making deliveries happen,” Dominguez-Larrea says. “It’s a well-orchestrated partnership: global brand know-how on our end and the capabilities to execute and local knowledge on their end.” For transportation of the food, some stores hire brand-new drivers while others connect with drivers from their third-party aggregator. But implementing delivery isn’t just about new technology, additional employees, and a gaze toward the future. It goes back to that idea of also preserving some of KFC’s heritage. The stakes are obviously a lot higher with delivery. Dominguez-Larrea points out that KFC is now in charge of managing its product all the way from the moment it leaves the store to the moment it arrives on the customer’s doorstep. Dominguez-Larrea firmly believes that this delicate balance of technology and a human touch is a recipe for success at KFC. Once delivery fully encompasses all stores in Latin America, the Caribbean, and the United States, who knows what the future holds? Regardless of who’s currently portraying him in the media, the Colonel would be proud. Bringg is proud to partner with KFC Latin America. Our delivery logistics platform offers the real-time capabilities they need in order to streamline their operations for peak efficiency and create perfect delivery experiences for their customers. Learn more at www.bringg.com.